Ready to spice up your grammar lessons? Play Truth or Dare! 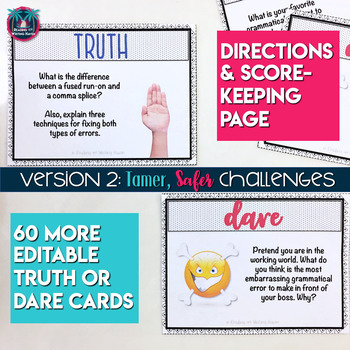 While Truth or Dare in real life can be wild and crazy, Truth or Dare Grammar Style is school appropriate, focusing on the building blocks of typical grammar instruction. Students will be challenged with prompts about the parts of speech, types of sentences, phrases, clauses, punctuation, and more. This game is a wonderful way to add variety to your test preparation lessons, as it focuses on many of the skills tested on the ACT / SAT English assessments. It's also perfect for a final exam review sessions, literacy centers, and station activities, among other possibilities. The cards can be broken up into smaller groups and used in different segments...use each smaller group of cards as it applies to your current grammar instruction. This resource includes a sheet with directions for play and score keeping. Also, due to recent updates, there are now 2 versions...a spicier, goofier version for your extroverts and a tamer, safer version for the introverts. 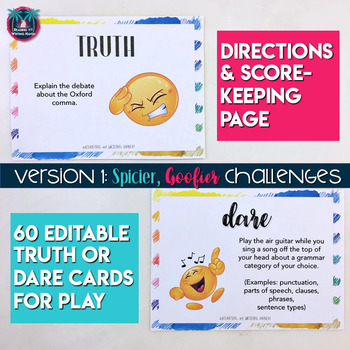 Each version includes 30 Truth cards and 30 Dare cards, equalling 120 cards total. IN ADDITION, both versions of this game are now EDITABLE in PPT. Change the prompts as needed to suit your students and curriculum. 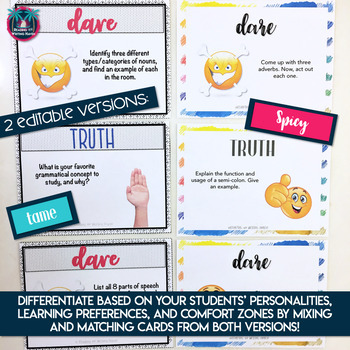 This game is an excellent way to implement differentiation, appeal to students' interests, and allow for a student-centered learning environment. Great for test prep, review, or practice, this product can be utilized as a review activity, small group or whole class, as well as a competition-style game. It could even be used for regular task card work or station activities. 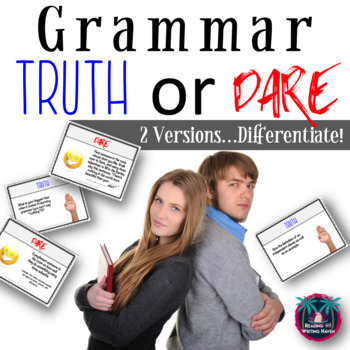 Grammar Truth or Dare is ideal for any middle or high school classroom that calls for game culture. Make sure your students are familiar with the terms before playing. I hope this product makes teaching grammar more fun, relevant, and understandable for your students! ***IMPORTANT: This product is included in two larger bundles! 1. Grammar Games Bundle in my store.